Another great poet, roughly Hesiod’s contemporary (give or take fifty years!) and again, possibly more a poetic tradition than an individual man. Homer is reputed as the author of the Iliad and the Odyssey, two great epic poems which, between them, largely defined what heroism and aristocratic good behavior should be in Greek society—and, you might say, to this very day. 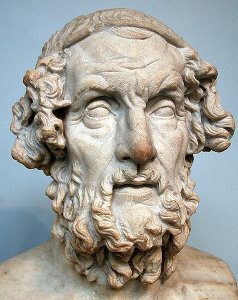 Homer, by a Roman sculptor living seven hundred years after his death. We still say that someone or something is “Homeric.” We owe to this one tradition the whole notion of what a “hero” is—of what is martial valor, what is generosity. Many of the ideals of “chivalry” owe as much to Homer than to any Germanic ideals. The rediscovery of the Iliad and Odyssey by Petrarch (never lost in the Byzantine East, but lost in the West) heralded intense interest in Homer, whose heroes adorn the art of the Renaissance and Neo-Classical as freely as the Archaic and the Classical eras. It is possible that Homer’s work is the most influential written work in the West—perhaps in the world. What is true is that the Iliad remains the finest war-story ever told, and if you haven’t read it, you should. The Odyssey is pretty good, too!